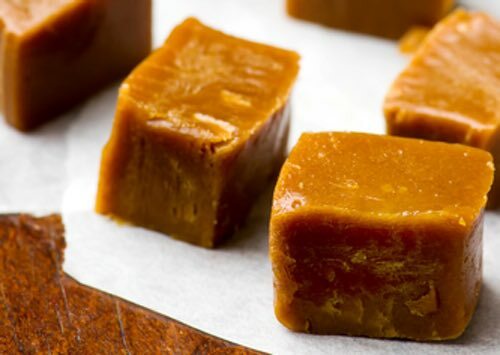 Choose one of Grandma's homemade butterscotch candy recipes and make a plateful of homemade candies that are so good tasting, they will melt in your mouth. This traditional English confection is easy to make, so enjoy some tonight. But make plenty, as it tastes so good. Three cupfuls of white sugar, half a cupful of water, half a cupful of vinegar or half a teaspoonful of cream of tartar, a tablespoonful of butter, and eight drops of extract of lemon. Boil without stirring till it will snap and break. Just before taking from the fire, add a quarter of a teaspoonful of baking soda, pour into well-buttered biscuit tins, a quarter of an inch thick. Mark off into inch squares when partly cold. Boil one pound and a half of coffee sugar (white, but not granulated), half a cup of sweet butter, half a teaspoonful of cream of tartar, and just enough water to dissolve the sugar. Boil without stirring until it will break easily when dropped into cold water. When done add one teaspoonful of lemon juice, or ten drops of extract. Pour into well-greased pans, and when almost cold mark into small squares. 1 cup sugar, 2 tablespoons vinegar, 1/4 cup molasses, 2 tablespoons boiling water, 1/2 cup butter. Boil ingredients together until, when tried in cold water, mixture will become brittle. Turn into a well-buttered pan; when slightly cool, mark with a sharp-pointed knife in squares. This candy is much improved by cooking a small piece of vanilla bean with other ingredients. Two cups brown sugar, one-half cup butter, one-half cup water. Boil all together until a little poured in cold water will form a hard ball. Stir constantly to prevent burning. Pour into buttered pans one-quarter inch thick. When cool mark in squares. Butterscotch, often written as "Butter Scotch" in the old cookbooks is an old English confection that had its origin in Doncaster, England. Samuel Parkinson began making his famous butterscotch candies in 1817, and Parkinson's Butterscotch became one of Doncaster's main attractions until it stopped production in 1977. A Doncaster couple resurrected the original recipe in 2003, and Parkinson's Doncaster Butterscotch Ltd. now sells its famous confection worldwide. We think the "scotch" part of the name is not derived from Scotland at all, but from the word "scorch," as the sugar mixture is heated to the soft crack stage at a high temperature. Or, maybe even likelier, the "scotch" could be derived from the fact that the candy is traditionally "scotched" or scored and cut into pieces, just before hardening.